It’s appropriate that an “organized sampling of the world” would include at least one point in northern California that’s within a grove of redwood trees. Coast redwoods are a natural symbol of northern California - stretching from Monterey County (just south of here) to near the Oregon state line. They grow to be the tallest trees in the world, and can exceed 115 meters in height. The trees in this grove are only about half this height, as they are ‘second growth’ trees, following extensive logging in the 19th and early 20th centuries. 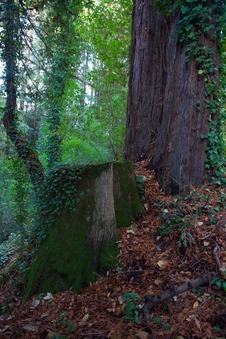 Note that the Degree Confluence Point itself lies on top of a large redwood stump - a remnant of this earlier logging. Near the point, I saw several examples of another iconic symbol of northern California forests - the banana slug. The banana slug is the mascot of the local university: The University of California, Santa Cruz.